Even before the turn of the century, the preservation of natural resources became a growing concern to our society and even the world. 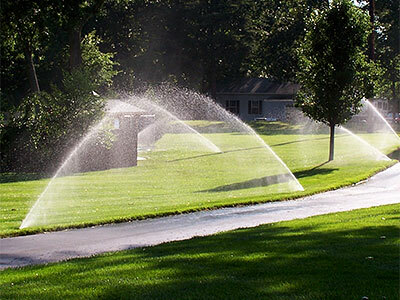 RJ Lawn Service recognizes proper irrigation maintenance is one of the keys to managing a healthy community water supply while maintaining property appearance. Our irrigation specialists can provide start-up, backflow prevention testing, shutdown/winterization, and regular maintenance of your irrigation system. We will program the system to ensure your grass and plant material receive the necessary amount of water required to keep them looking healthy and wonderful throughout the growing season without wasting valuable resources. Our staff is on the cutting edge of growing trends in irrigation equipment and management with certification by the national Irrigation Association and as an EPA Water Sense Partner. We are knowledgeable about a range of systems from residential controllers to sophisticated computer aided systems. Contact us today to keep your irrigation system operating efficiently and effectively. 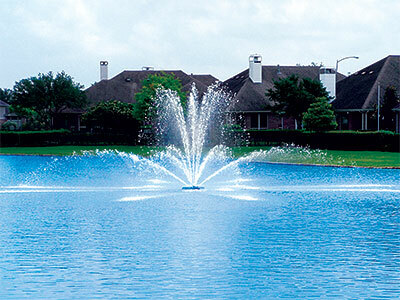 RJ Lawn & Landscape is able to take care of all your large fountain and pond aerating needs. We carefully install, service,remove and offer winter storage of large pond equipment for commercial and residential applications. As an authorized Otterbine Service Center, our specialized staff performs all maintenance service needs and troubleshooting of fountain equipment right here in Waukee. Whether your water feature is large or small, our trained staff can help you find the right equipment to manage water quality or improve a water feature's appearance. Otterbine offers many options in Aerating Fountains, Giant Fountains, Industrial Aerators, and Subsurface Mixers to improve your water quality. Fountains can be used in a variety of applications to create sensational displays with optional lighting. Low-profile patterns and subsurface equipment are available in Industrial Aeration and Diffused Air systems which provide unique solutions to managing water quality. All equipment is guaranteed by Otterbine's Warranty Program. © 2019 RJ Lawn Service, Inc.